Cellucor COR-Performance Whey is a top-notch protein powder that’s become a staple among gym-goers everywhere. This protein powder has 25 grams per serving, which is a good amount for those looking to maintain and build lean muscle. The protein source is 100% whey protein from whey isolate and concentrate. This is a good protein that’s easily and quickly digested. It also has 5.5 grams of BCAAs per serving, along with digestive enzymes. The fat and carb content is really low, which makes it a good option for building lean muscle. This powder is also gluten free. The taste is better than average and it mixes well compared to other protein powders. It can also be added to oatmeal, yogurt, pudding, pancakes, ice cream, or other baked goods. This protein powder can be used before or after workouts or as a snack or meal replacement. It does contain milk and soy ingredients, so keep that in mind if you’re allergic or sensitive to either. It also has artificial flavors and sucralose, an artificial sweetener, which may cause some bloating and stomach pain in some people. So overall, we gave Cellucor COR-Performance Whey 4 out of 5 stars, which makes it an above average protein powder. Cellucor COR-Performance Whey mixes relatively easily. In a pinch, it can be mixed with just a spoon and water but it will still have some chunks. For a really nice consistency, definitely use a blender or shaker with this one. It says to use 5-6oz of liquid per one scoop of powder. This one is definitely a lot easier to use than some other protein powders, so kudos to Cellucor. We tried Cellucor COR-Performance Whey in the Strawberry Milkshake flavor. We thought the taste was better than average. This particular protein powder line is based off dessert inspired flavors (without the guilt). So naturally the taste is sweet. We did notice that classic “old school” protein powder aftertaste though. Even just when mixed with water, the taste is pretty good. It definitely tastes exponentially better when mixed with milk (2%, almond, coconut, etc). It comes in quite a few other flavors, such as chocolate peanut butter, whipped vanilla, cookies n’ cream, chocolate chip cookie dough, molten chocolate, cinnamon swirl, and peanut butter marshmallow. As I said, they definitely focused on the dessert inspirations and is a great option if you have a sweet tooth. As for the macros, each serving contains 25 grams of protein, 1 gram of fat, and 4 grams of carbs. This protein amount is good for those looking to build and maintain lean muscle mass. The fat and carb content is also really low, which is something we always like to see! The calorie content is 130 calories per 1 scoop/serving. Overall, this is a pretty decent macro combination for those looking to gain some lean muscle. Cellucor COR-Performance Whey has some things we definitely like about their ingredients. This powder uses 100% whey protein. The protein sources are whey isolate and whey concentrate. Whey is a quality protein and is quickly digested in the body. It also contains 5.5 grams of naturally occurring branched chain amino acids (BCAAs), which may help aid in muscle recovery. This protein powder also includes digestive enzymes, which is a plus. This product does contain milk and soy ingredients, so keep that in mind if you’re allergic or sensitive to those. It is gluten free though, which is a big perk for some people. This protein powder has artificial flavors and sucralose as the sweetener. Sucralose is an artificial sweetener and may cause some bloating and stomach pain in some people. I didn’t notice any side effects when taking Cellucor COR-Performance Whey. I was a happy camper. This protein powder does contain milk, soy, and sucralose (artificial sweetener), which may cause some people to have pain or bloating after taking. After using this protein powder for a while, we’d say it’s best used for those looking to build and maintain lean muscle. The 25 grams of protein per serving is a good amount to help build muscle and get in that extra needed protein. It suggests taking 1-4 servings daily (25g-100g of protein), either before or after workouts or as a quick snack throughout the day, which could really ramp up your daily protein intake. Cellucor COR-Performance Whey costs $29.99 for a 1.94-pound container. That works out to about 4.61 cents per gram of protein. This is about average or even slightly less expensive than average for a protein powder. I think it’s a great value for the price. I’d say this is a good, relatively affordable way to get some extra protein into your diet. Cellucor offers a money back guarantee for all of their products and merchandise. They offer a 30-day, 100% satisfaction/money back guarantee. I was really excited to see some sort of guarantee offered by Cellucor. Just make sure that you bought the protein powder from Cellucor.com and they will honor the guarantee. 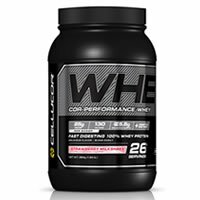 To buy Cellucor COR-Performance Whey, click here.